This is the kind of recipe you'll find in church cookbooks from your grandmother's youth, and really, aren't those the best kind? They use common ingredients and simple steps, and happily, they yield repeatable, attainable, and tasty results. The very fact that many of these recipes are still being made speaks to their total awesomeness. 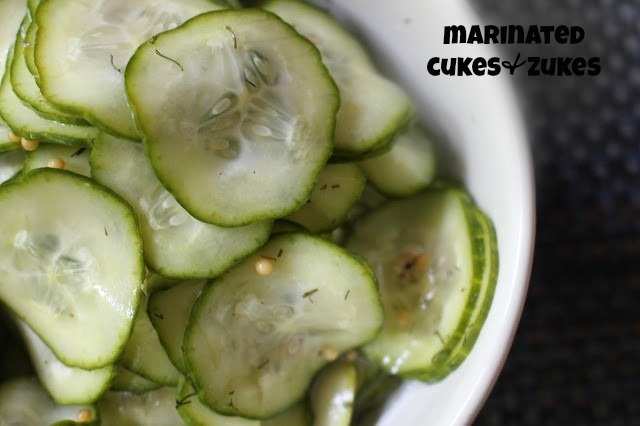 Marinated cucumbers is a side dish is as basic as they come--the ingredient list is short and unassuming, and the procedure takes all of 10 minutes to complete*. The resulting creation, though, is terrific, and it's absolutely fitting to be served alongside any number of entrees. It's salty, sweet, and sour, and it complements everything from a fat and juicy grilled ribeye to filling and satisfying chicken gyros. You'll almost certainly find this dish at most spring and summer picnics and potlucks, and it always goes fast, at least in my experience. *This speediness is mostly attributable to my handy dandy handheld slicer from OXO. Most people include onions in their cucumber salads, but since I really, really dislike the taste of raw or even pickled onions (initially and when it's still there two four eight hours later), I always leave them out. I added some zucchini to this batch, mostly because people are telling me we'll soon be swimming in squash and I'm doing my best to use them as they ripen. ** Dill is my go-to herb for this, and it's the classic choice, but do what you will. I also used mustard seeds thinking they might be fun, and they were. What do you use? Do you like yours sweeter or sour-er? I may have bumped up the sugar a little in my version, but that's pretty much my standard operating procedure. I have a feeling most of the grandmothers out there would approve. 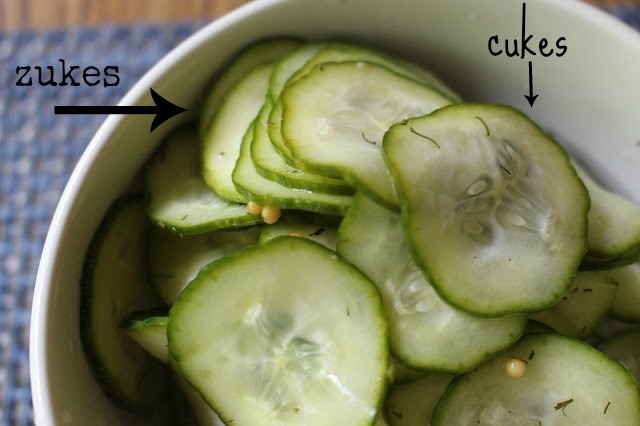 Place the cucumbers in a large bowl. Sprinkle with salt and pepper. Combine the vinegar, water, and sugar in a saucepan over medium-high heat. Bring to a boil, and pour over the cucumbers. Stir in the dill, cover, and refrigerate until cold, at least 1 hour (but overnight is better). For a little thicker sauce for this salad, you can whisk some mayo into the vinegar. I learned that from my grandmother, and love it. You and I are on the same wavelength! I was just thinking of my mother's 'Dutch Cucumbers,' which is a marinated-in-vinegar salad of sliced cucumbers and onions. Very yummy (I like a few onions, but certainly not an excessive amount). I like your thought of adding in zucchini. Brilliant! I haven't made cucumber pickles for ages. I put chilli in mine. A shortened version of this is a staple here when hubby is BBQing. I just slice the cukes place on large plate & cover w salt and pepper and cover w vinegar. They're always gone before the "Q" is ready to serve! I like the mix of both cukes & zukes! Makes for a refreshing and tasty summer salad. Sorry to hear about your zucchini plants! Marinated cules and zukes sound good to me! I'd like it to be a litte on the sour side and spicy! I like both cukes & zukes!! Perfect for summer! I think I could eat an entire jar of these all by myself. Nothing beats fresh-made pickles. They have such crunch, still possess the fresh vibrancy of the ingredient. My extra cucumbers get sliced and pickled as "hamburger dills." My husband loves pickles but the CSAs always give bigger cukes, so he was very happy when I figured out my solution.